Azerbaijani student, who studied in Japan, was in the State Committee on Deals of Refugees and Internally Displaced Persons. Garay Farhadov and Fuad Huseynov, deputy chairs of the State Committee on Deals of Refugees and Internally Displaced Persons of Azerbaijan Republic met Alibay Mammadov, who studied in Japan and at the same time, is the president of Foreign Students Association of Hokkaido University on September 22. 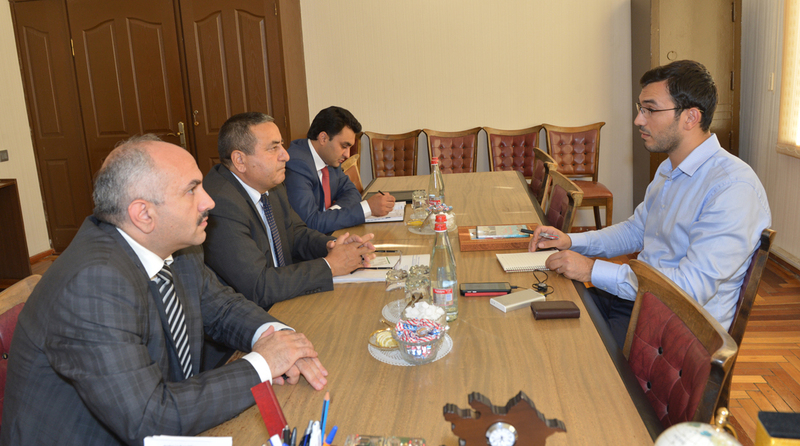 They exchanged views in the meeting with Alibay Mammadov, who stressed that there is a huge need to give detailed information in order for expensive publicity of the information on Armenia-Azerbaijan, Mountainous Karabagh conflict, the history of the problem, the situation of our refugees and internally displaced persons in the international arena. It was noted that, in the last 200 years the Azerbaijanis were forcibly subjected to removal from their eternal lands, and to the ethnic cleansing and deportation policy several times as a result of the complex political processes in the South Caucasian region. It was also mentioned that, UN Security Council has adopted four resolutions regarding with the liberation of occupied lands of Azerbaijan, return of the refugees and displaced persons to their native lands. Unfortunately, these decisions and resolutions are still on the paper. Armenia, which neglects the requirements of the international society, is continuing to operate illegally in the occupied territories of Azerbaijan. The negotiations which are underway more than 20 years through OSCE Minsk group do not bear any fruit in this regard. In the meeting it was brought into attention that, this dispute is not only dangerous for South Caucasus region, but also for the entire world. Because Armenia currently uses Azerbaijani territories as a transit to transfer narcotic substances and prepares terrorist groups which are directed toward different countries. The Azerbaijani student Alibay Mammadov by expressing his gratitude for sincere acceptance and detailed information stressed that he met internally displaced persons and got acquainted with their living condition while coming to Azerbaijan. He also mentioned that, his main aim is to provide extensive dissemination of the realities on the conflict in Japan.